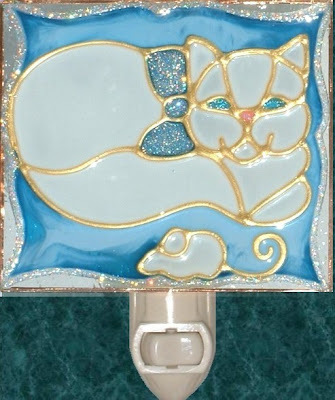 We've created these two handpainted cat nightlights in order to showcase the unique qualities of the breed. Widely set large eyes over a very short nose have been painted either blue or green and sparkle with translucent glitter. The ears are also set far apart and the head is broad as is the body. The legs are short and the tail is extremely bushy. Making the very rounded body short lengthwise gives an appearance of long, thick fur. For these two designs we chose blue and pink as the backgrounds and the bows because these colors look appealing either matching the eyes or providing a complementary color contrast.